Visit our website www.premiergroup.ca and click on ‘Online Quotes’ . Follow instructions on the PRESTO login page to sign up for access today. 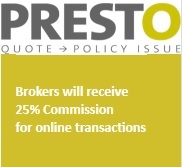 For every quote you issue in PRESTO, you’ll be entered to win great prizes such as an Apple watch, or IPad each month.